FILE - U.S. Deputy Secretary of State John Sullivan pictured speaking to the U.N. Security Council, Jan. 19, 2018, says "we are seeing the Taliban's momentum begin to slow" on the battlefield in Afghanistan. U.S. lawmakers grilled Trump administration officials Tuesday about the war in Afghanistan, saying the new White House strategy was inconsistent and was not producing results. The comments made at a Senate Foreign Relations Committee hearing reflected growing frustration in Congress about the U.S.-led war, which is entering its 17th year. ​As recently as November, General John Nicholson, the top U.S. commander in Afghanistan, acknowledged that the conflict remained a stalemate. Since then, a wave of high-profile insurgent attacks have rocked the capital, Kabul. The Taliban now controls or contests almost half the country, according to latest U.S. estimates. Despite the setbacks, U.S. Deputy Secretary of State John Sullivan, who is helping oversee the new White House strategy, gave a positive assessment of the conflict. "The president's South Asia strategy is showing some signs of progress," Sullivan said. "On the battlefield, we are seeing the Taliban's momentum begin to slow." But lawmakers from both parties expressed skepticism. "Something is clearly not working," said Senator Ben Cardin, a Maryland Democrat and longtime Afghan war critic. "By any standard, the current security situation is grim." 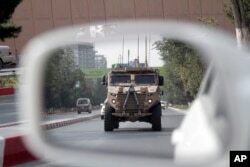 FILE - A patrolling U.S. armored vehicle is reflected in the mirror of another vehicle in Kabul, Afghanistan, Aug. 23, 2017. Some lawmakers took aim at President Donald Trump, who last week said he didn't want to talk with the Taliban — a statement that seemingly contradicted his own strategy. After Sullivan and a top Pentagon official told the lawmakers that the U.S. was in fact still open to negotiations with the Taliban, lawmakers pressed for more details. "You can see that the world and those involved in the peace process may be pretty confused about what the U.S. position is. What is it?" asked Senator Chris Murphy, a Connecticut Democrat. Sullivan said he thought Trump was expressing a reaction to last month's terrorist attacks, and was pointing out that "significant elements of the Taliban are not prepared to negotiate." "And it may take a long time before they are willing to negotiate," he added. But many in the Senate appear tired of waiting, and that impatience was on display Tuesday. "We're in an impossible situation. I see no hope for it," said Republican Rand Paul of Kentucky, another longtime war critic. "I feel sorry for putting the military in this position." Even Tennessee's Bob Corker — the Republican chairman of the committee who has spoken positively of the new White House plan — was skeptical, citing high attrition rates among Afghan defense forces, rampant corruption and a dependence on foreign aid. FILE - Senator Ben Cardin, D-Md., asked Trump administration officials on Feb. 6, 2018, whether Americans should simply accept that the Afghan conflict is "a forever war." "What is the end state that U.S. and NATO troops are fighting for?" Cardin asked. "We've been there for 16 years. Should the American people accept that this is a forever war?" The criticism came as the U.S. military has been ramping up airstrikes on the Taliban and sending thousands more troops to Afghanistan. On Tuesday, the U.S. military said a B-52 dropped 24 bombs on the Taliban. The Pentagon said it was a record for the "most guided munitions ever dropped" from that type of aircraft. According to a statement, the targets included Taliban training facilities in Badakhshan province, an area that until recently was relatively calm. The statement said the airstrikes also destroyed "stolen Afghan National Army vehicles" that insurgents planned to use in truck bomb attacks. A U.S. military spokesperson did not immediately respond to VOA's request for comment on the type and number of vehicles that were destroyed. Taliban militants are thought to have stolen dozens of Humvees and other U.S.-made vehicles in recent years to create massive fortified and disguised truck bombs. Polls show the U.S. public is divided on Trump's plan to expand the war in Afghanistan. When Trump unveiled the strategy last year, a Politico/Morning Consult poll suggested 45 percent of voters supported increasing U.S. troop levels, while 41 percent opposed the plan.